Fore. 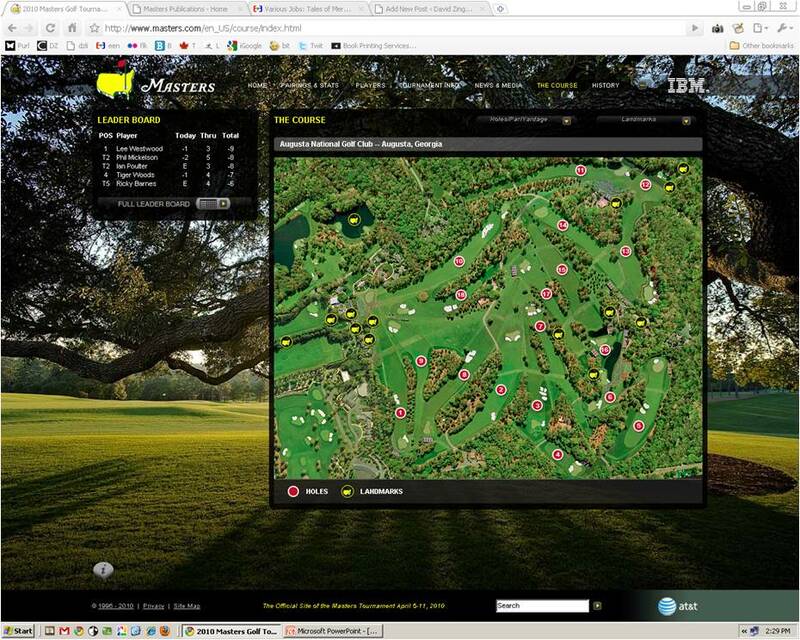 What we can learn about improving Enterprise 2.0 from The Masters website? 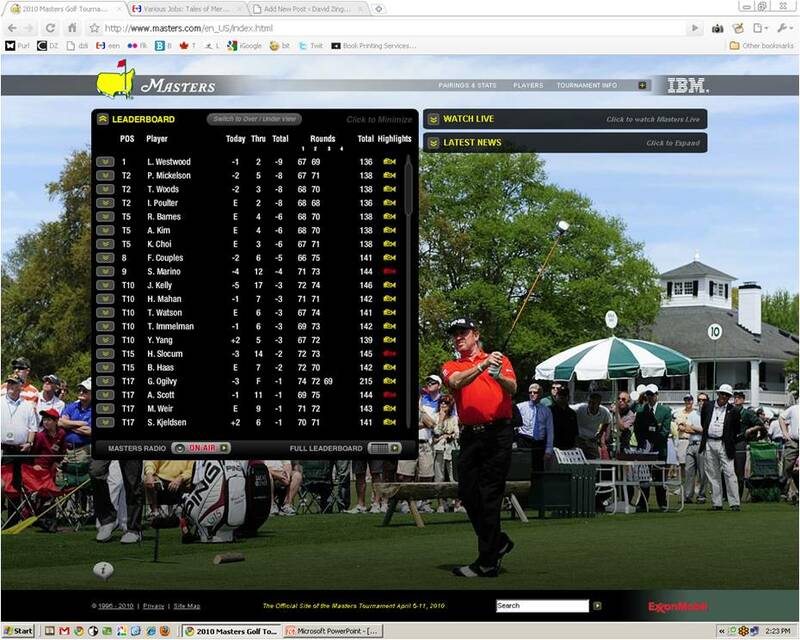 Before you watch the golf tournament I encourage you to visit The Masters Website and think about how you can apply 5 of the principles and practices they follow to improve your Enterprise 2.0 or Social Business Software site. Handicap. This post focuses on the information and data they present not on the principles and practices of social interaction. It also does not focus on the performance of Tiger! Score an eagle. 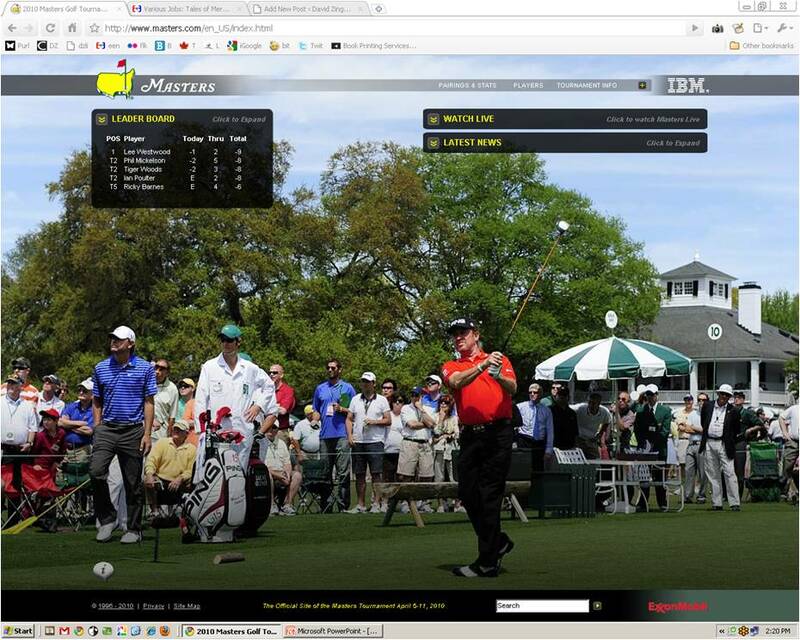 I visited the Masters website during the tournament. I loved the coverage and it made me think about what we can learn to improve our Enterprise 2.0 or Social Business Software sites. 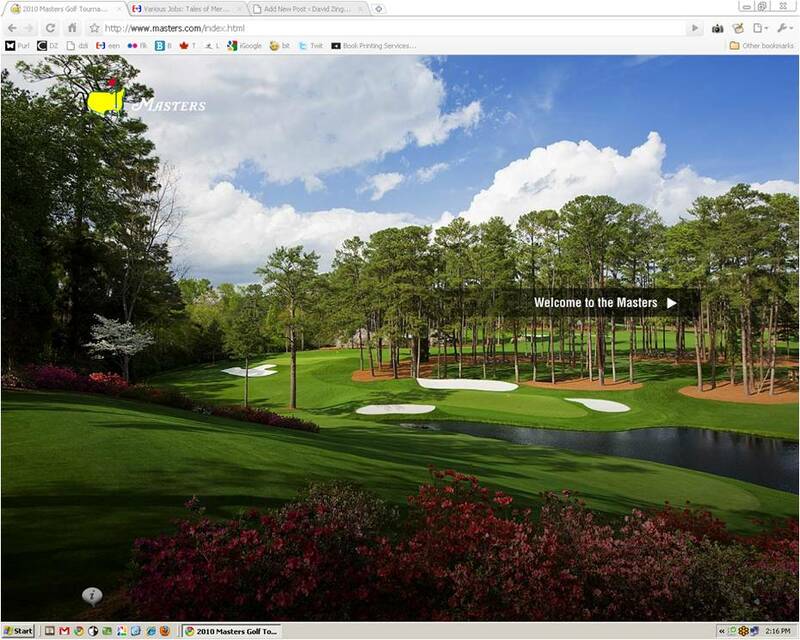 Of course The Masters is a commercial venture with a lot of financial backing and you might not have the resources or budget to copy them but I encourage you to determine how you could improve your own internal social media site. 1. Offer a visually appealing and simple landing page. 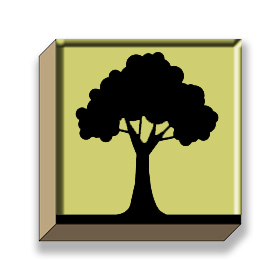 Welcome your community with a strong visual image that draws them in. Don’t try to accomplish too much and guide them on the next step into your Enterprise 2.0 community. 2. 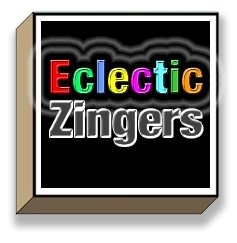 Keep being visually appealing while beginning to offer more information. The next page still remains very visual and now begins to offer a few more options. Don’t try to do too much with your site too early and work at full engaging your community into your site. 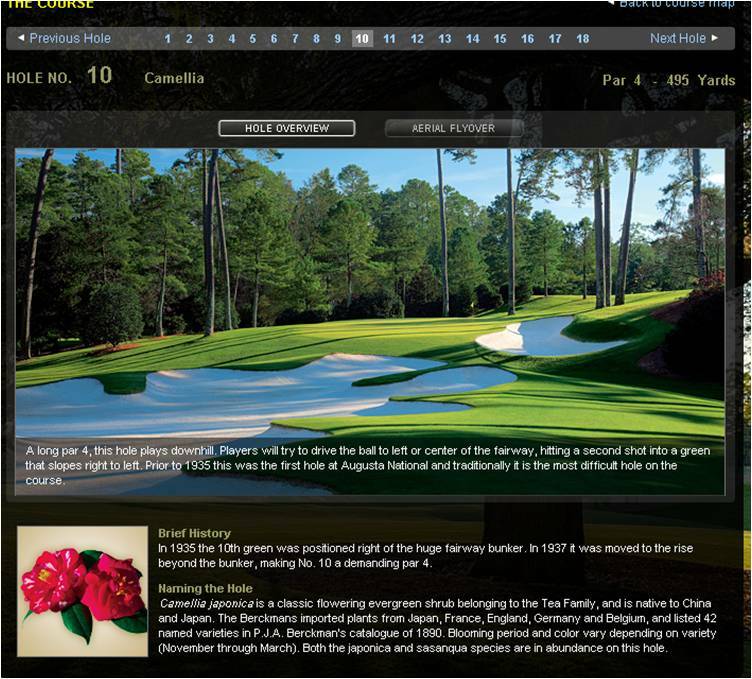 The Masters offers great data presentation with the opportunity to customize your data, choose favorites, and watch selected video highlights. I love the score board that makes it easy to determine how each golfer is doing. How well do you present your organization’s data on Enterprise 2.0? I also appreciate that you can favorite a few golfers and watch quite a few of their selected shots without having to patiently wade through a lot of video you never wanted to watch! 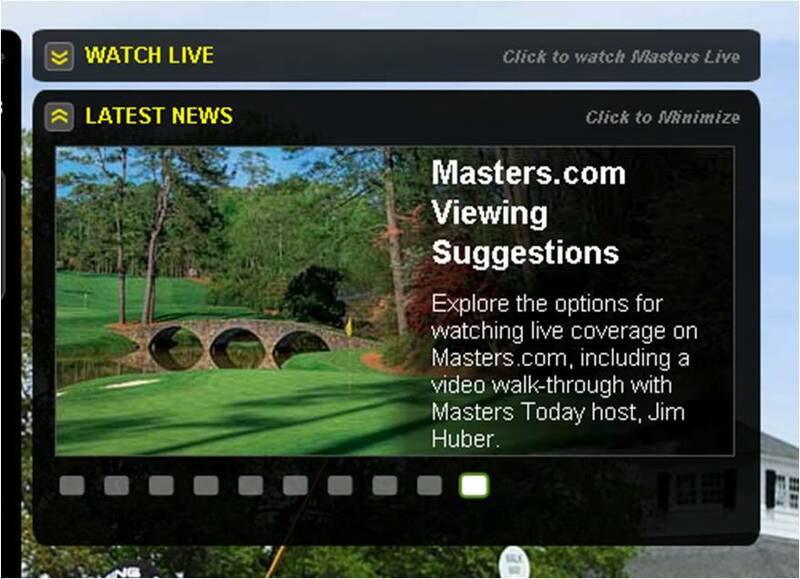 The Masters offers great news updates. You get to select from 10 stories offered with compelling headlines and another strong visual image to draw you in. Also don’t forget to educate your community on how to use your site. 5. Ensure you offer a lot of information and data for community members who are looking for more. As you go deeper into the site you can get much more information and data. Do you communicate a compelling view of your entire enterprise? I love the map of the course with the ability go much deeper into each of the 18 holes and learn about the history and naming of hole and be able to get perform a flyover. Can everyone in your enterprise see the “whole course” of your enterprise, drill down to their area, and get a flyover of the key points? Offer a visually appealing and simple landing page. Keep being visually appealing while beginning to offer more information. Offer great data that is easy to customize and view. Offer compelling news updates, with visual appeal, choice, and conveyed as a story. Ensure you offer a lot of information and data for community members who are looking for more. Click here to view the Master.com site and think about other ways you can improve your site. I wish you all the best in 2010 in mastering your Enterprise 2.0 or Social Business Software site. By the way, I will have to take a few swings at my employee engagement network site for the next few months. in all directions at once. Do those served grow as persons? Do they, while being served become healthier, wiser, freer, more autonomous, more likely themselves to become servants. And, what is the effect on the least privileged in society? Will they benefit or at least not be further deprived? Tom Jablonski wrote a power post about servant leadership and work. There are many direct implications for those of us involved in employee engagement. The quotation at the start of this post is from Tom’s article as he quotes Robert Greanleaf on the test of a servant leader. Here is a reposting of Tom’s original work. Any item that is bold print was done by me to emphasize the point. To read Tom’s original article, click here. In the movie MOON, it is the near future and astronaut Sam Bell works a solitary job on the far side of the moon. His cooperate employer Lunar Industries is mining the answer to earths energy problems – Helium-3 from the moon’s rocks. As he nears the end of his three-year contract to keep the operations running, he experiences an accident while trying to conduct repairs to the mining equipment. Waking up in the sickbay of the moon station, he is confronted by a clone of himself. Sam and his clone discover that the cooperation has stockpiled a multitude of incubating clones waiting to be awoken to replace them when their bodies are worn out by the end of their three-year contract. By simply replacing the workers with clones, the corporation can avoid the high costs of sending new recruits to the moon and the extensive training that would be required to replace them every three years. The corporations of today may not have reached the levels of unethical behavior portrayed by Lunar Industries, but they are driven by the same motive that fueled it – profit. Robert Greenleaf understood well the consequences of corporations driven by profit, or money above and beyond that needed to meet their needs. 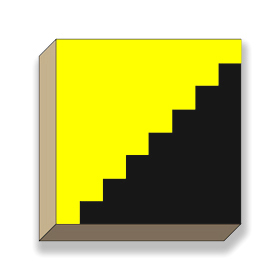 Where this best test becomes a true test and where our current corporations fail is when you expand the concept of who is served by the organization. Who is served is not just the shareholders, it is not just the CEO’s, it is not just the management, it is not just the workers, nor is it just the customers of the corporation. Those that are served needs to include all those who are touched by the consequences the corporation’s actions and operating principles. The key question “what is the effect on the least privileged?” really gets at the need to be aware of who is served and who and what are the impacts. These consequences need to include those from the supply chain, the environmental impacts on the ecosystem and our planet, and the social and cultural impacts on the community. Our globalized corporations’ serve the profit motives well by hiding the distant impacts. As we become more aware of the consequences of these motives on our people and our planet, moving corporate operations off earth and to the moon do not seem so far fetched. To avoid such a future, it is time to stop cloning the profit driven motive of our corporate world and it is time to stop trying to eclipse their effects with terms like “corporate social responsibility” or “the triple bottom line of profit – people – and planet”. Instead, we need to create new models of operation where we can truly be aware of our actions and truly test the resulting servant-leader institutions. We are all leaders and I encourage you to follow the Servant Leadership Blog. Thanks to Tom Jablonski for giving me permission to repost this wonderful article. His post exemplifies and extends one of my most basic themes in our field: employee engagement for all!